Happy Friday friends! It’s been a glorious week with the best weather we’ve had in a loooong time that has put all of Houston in such a cheerful mood. It’s so super hot and humid in the south, so when that first cool front rolls in, we are all so thankful! With that being said, it’s hard to be too cheery when you know that your friends in Florida have just been through a devastating hurricane that has destroyed the lives and homes of many. Please know that you are in our hearts and prayers. You are strong and resilient and have many caring people on your side. Earlier this week, I partnered with Memorial Hermann for Breast Cancer Awareness and each Tuesday I’ll interview and expert to help us learn more about breast cancer, how we can keep ourselves healthy and how we can support our friends and family (or ourselves) when we are going through it. I’m honored to get to join forces for important things like this. Now it’s Friday and I hope you’re looking forward to a relaxed weekend to rest and recharge. I feel like I need it! Today, is my 3rd Amazon fashion haul (#1 here & #2 here) and I’m excited about this one! 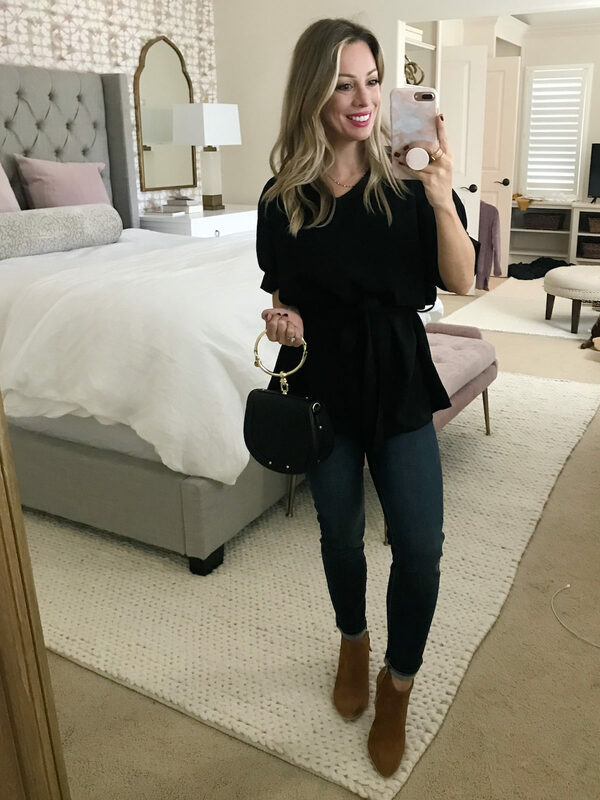 It’s full of lots of great things for Fall and two new tops I’m absolutely in love with – not to mention the bags! But, I’m getting ahead of myself! Okay, now onto the fun stuff. Let’s jump into this Amazon clothing haul! AND, see a LIVE try-on saved to my Instagram Story Highlights! I’m so thrilled to see that J. Crew Mercantile is on Amazon now and their things are super cute! First up, this pair of jeans is the perfect mid rise skinny jean with dark wash. There’s a slight bit of whiskering to give them a hip, modern feel, but not so much that they don’t feel classy. This is the style of jean I would wear on casual Friday because it can be easily dressed up and make to look professional. Jeans Fit: The jeans fit TTS, but I ordered down 1 and almost couldn’t get them on, then they stretched a tad. Bottom line, you should be fine ordering your normal size. I paired it here with a peplum top in a warm burnt orange, but it also comes in other colors. Top Fit: The top is a boxy fit and runs short. I have a longer torso and it still fit okay when I sized up to a small. I’m also quite smitten with this little Chloe dupe bracelet bag! I spent a lot of time searching around and was comparing the one I got ($42 & Prime) and this one ($105 & Prime). Ultimately, I love the one I got and feel that the quality is good. The stitching is in tact, the colors are rich and gorgeous and the handle looks expensive and not cheap. It also comes with a crossbody bag strap, so you don’t have to hold it always by the handle. I bought the black and brown and love them both! 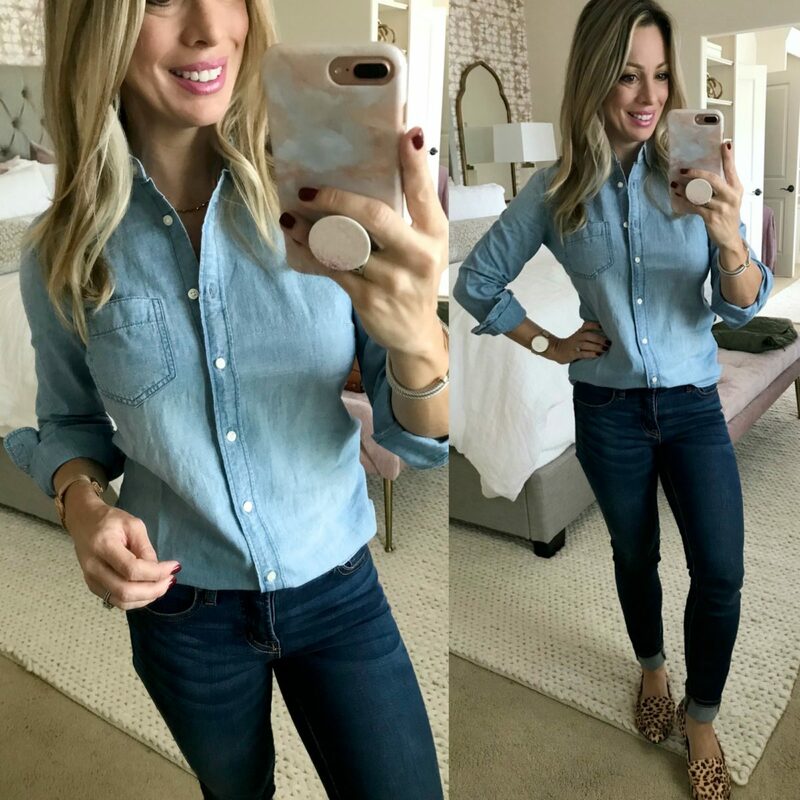 Of course we all need a chambray shirt in our closets- they look so good with white jeans, black, and even dark denim like here. I particularly like the wash and stitching on this one and how snappy casual it looks with the sleeves rolled. Top Fit: The top fits TTS, I’m wearing a 00 for a more fitted look. If you want it looser, I’d size up one. You can always layer a sweater over or a puffer vest for a punch of color. You can always layer a sweater over your denim top or a puffer vest for a punch of color. Isn’t the green in this one pretty for Fall?! And pockets! I love that it’s not too puffy so you don’t end up looking like a snowman! It also comes in a deep cranberry color. If you’ve ever tried searching for clothes on Amazon, I’m sure you know it can be hit or miss- I don’t even show you everything I ordered because I can’t recommend everything! But, I’ve had good luck with this brand Cable Stitch and feel like I can rely on them for good quality and stylish pieces. They are a bit more expensive than you might think for Amazon, but at $39, it’s still a good price for a well-made sweater. It’s 100% cotton with ribbed sleeves and waistband. I adore the yellow/white/navy color combo and the way blocking is artfully done on the sleeve. 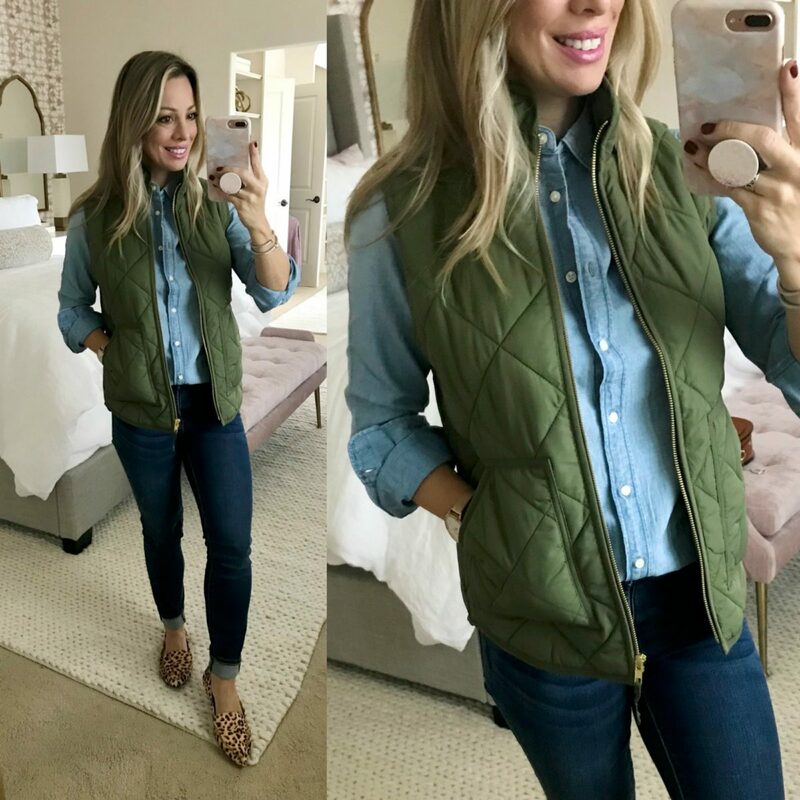 And it looks super cute with the J.Crew jeans and tan booties. Sweater Fit: The top runs a tad small, I’m wearing XS which fits me perfectly, but my normal size is XSP. If you are between sizes or prefer your sweaters looser, or plan to layer a turtleneck or another top underneath, I’d size up. Another Cable Stitch sweater, I was drawn to this one because I love neutrals (gimme all the black, white and grey!) and the way the neckline is detailed. 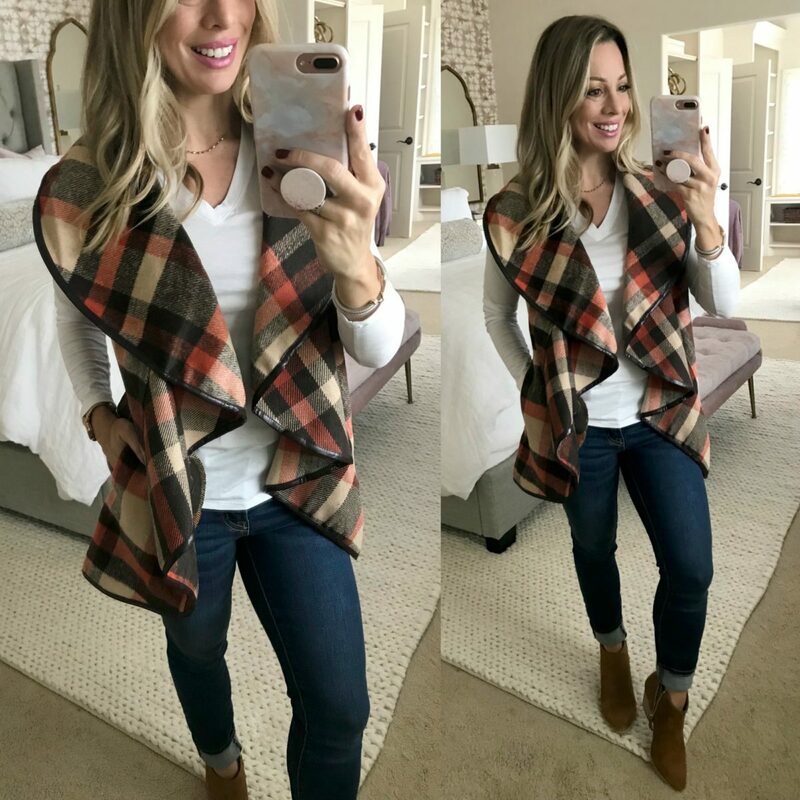 I was so excited to see this poncho style vest on Amazon. I wore a similar one at Project One Way this year and thought it was such a fun piece. It lays like a cape, which is reminiscent of the 60s, but has a cool modern plaid pattern. The faux leather trim is a nice detail and it has pockets. Top Fit: The top runs super small. I ordered and XS and felt like I needed to size up to a small or possibly even a medium. When the weather starts to turn cooler, one of my favorite Fall accessories is a scarf. I love the pop of pattern and color they add, but I always feel like you shouldn’t have to pay too much for them. 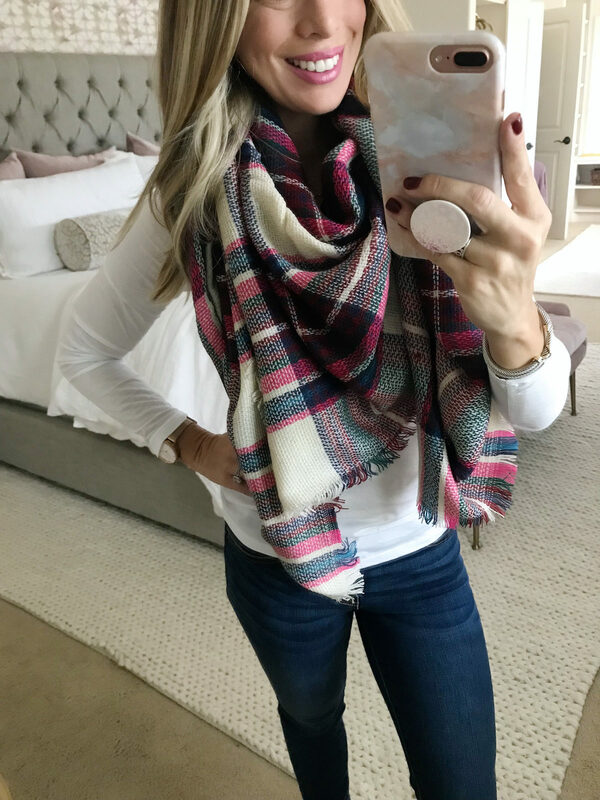 I’m crazy for the unexpected bright pink in this scarf and it’s only $13! 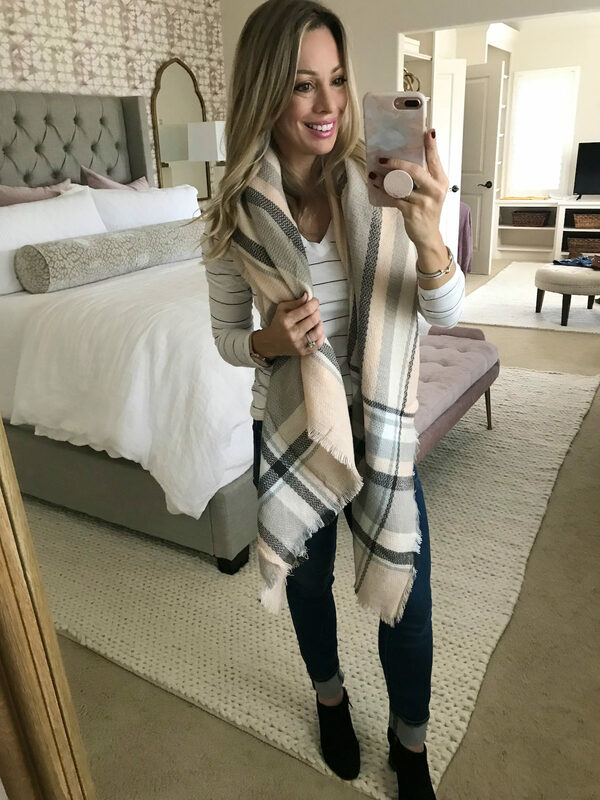 I swear I’m a sucker for a light grey/pale pink color combo and always gravitate towards scarves in this color. This one is by the same brand above and also only $13! At that price, I’m about to buy one in every color and give them as teacher gifts! This is the scarf I showed on Stories but didn’t care for the top! I wasn’t sure about this top until I tried it on because it looked so boxy. But, the tie waist creates a peplum shape that’s pretty cute! 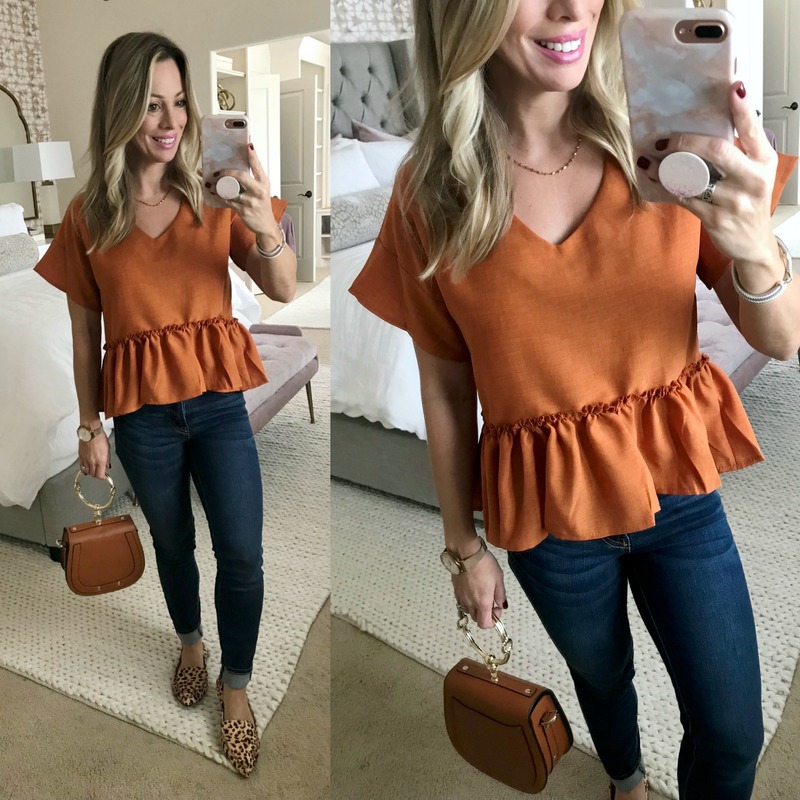 Blouse Fit: TTS, I’m wearing a Small and could use my true size for a more fitted look. I’ve gotten a few requests for shorter cardigans and found this thin knit cardigan that fit the bill. It’s a simple cut with double pockets and ribbed trim. The material has quite a bit of stretch and would look good layered over tops and dresses alike. Cardigan Fit: It runs small, I’m wearing size Small. I’m 5’1 and it hits me right at my hip. Now for an alternative, the long duster style cardigan. Don’t think that short girls can’t rock these- you can! I actually like how this one is on the thinner side so it’s not too chunky and overwhelming for a petite frame. It’s the same brand as the shorter cardigan with the stretchy material and pockets. Both of them come in lots of colors too. 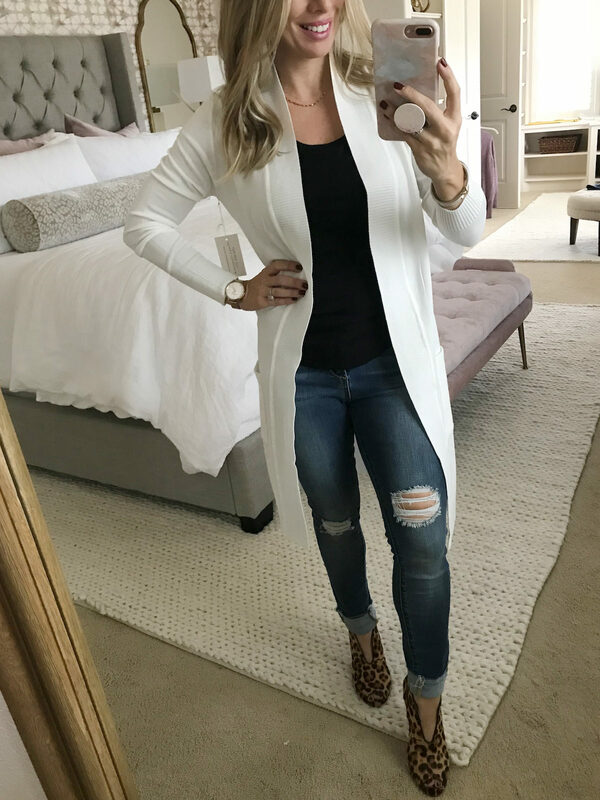 This lightweight length cardigan is exactly the type of thing I used to keep at the office for chilly AC days or when I wanted to look more pulled together without wearing a blazer. 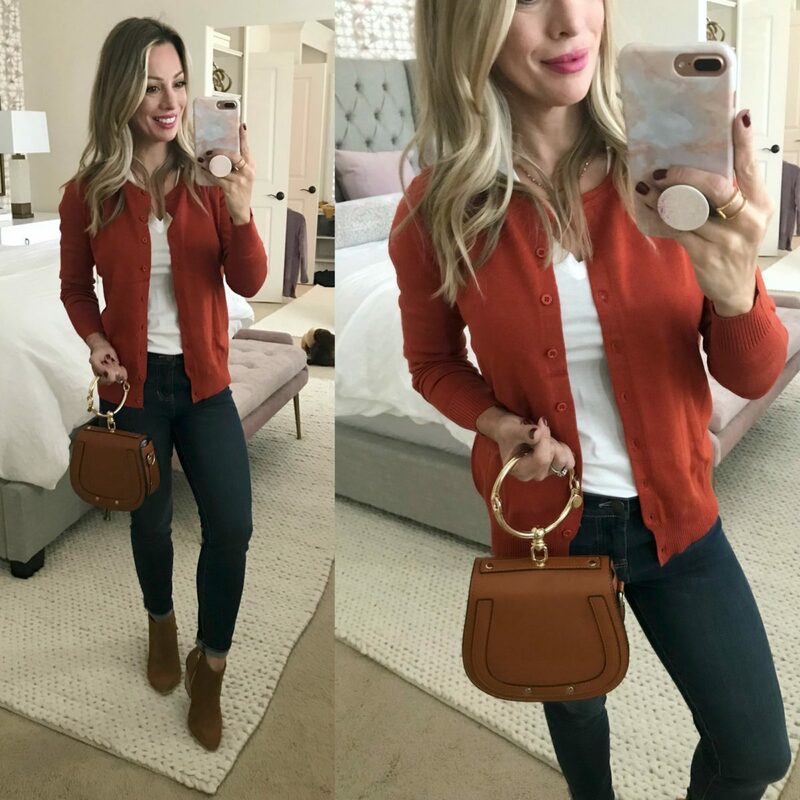 The burnt orange color caught my eye and I can say it’s a good quality cardigan that will look great with jeans, over dresses or with slacks. It comes is a million colors, so lots of options! Cardigan Fit: The cardigan runs small, I’m wearing size Small, so I’d size up one. Ooh, I’m smitten with this cardigan! I love how the neutral stripes give it a collegiate feel and it’s so nice and cozy! It’s nearly mid-October and in Houston, we’re still rocking the jean shorts. I was surprised how much I liked this dolman style pullover. It’s got a waffle knit texture and a cool, casual vibe. It can be worn on one or off shoulder. I’m clearly wearing the wrong bra with it- oops! I’d recommend wearing a strapless (this one is super comfy and keeps the girls up without fidgeting!) or your pretty bralette. Top: It’s a relaxed fit and I’m wearing size Small, so I’d say it’s TTS. The sneakers are new and you’ll be seeing more of them soon, but giving you a little sneak peek here! They add that pop of leopard in a sneaker and are so cushiony and comfortable! Now turning to everyone’s favorite style, athleisure! I found two AMAZING tops that I both highly recommend! First up, this color block long sweatshirt with a cowl neck. 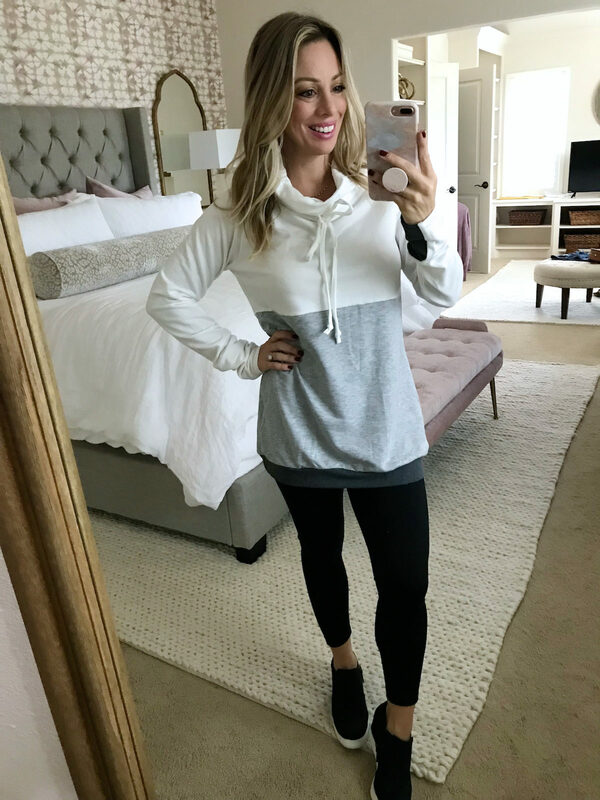 It’s so cute and sporty, perfect for running around on the weekends or lounging at home. The cowl neck is adjustable with the lace string tie. You can also find this top in lots of colorways. Top Fit: The top fits TTS, I’m wearing size small, which is a tad big on me, but that’s the smallest size it comes in. For the leggings, I still haven’t found any on Amazon that compare with the ones I’m wearing, so I’m not recommending the leggings that I ordered with this haul. They fit weird and I wasn’t comfortable in them, but I’ll keep searching! 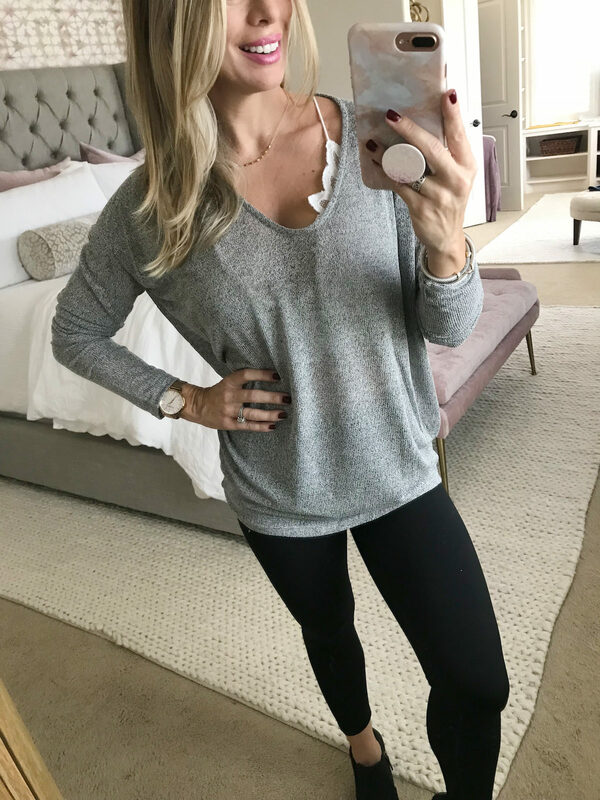 For another loungy-type top, this thin knit pullover does the trick- and it’s gotten nearly 400 positive reviews. It’s a bit sheer, but not totally see through. I thought this would be a good one you could wear with your pretty bralette to show it off! I wear a medium bralette, and I’m a 34D. Pullover Fit: TTS, I’m wearing size Small. Last but not least, I found a stunning party dress for you! I felt so elegant and classy in this dress! It has a beautiful lace overlay bodice with a nice v-neckline, but I LOVE the just below elbow sleeve length! Sooo pretty! The waist nips you in with a wide band and the skirt flows beautifully away from your body with a good bit of stretch. You’l be comfortable all night in this one and hopefully feel like the belle of the ball! Dress Fit: Size up, ladies! I’m normally a 0, but the 4 is the smallest size and fit me perfectly. The arms weren’t too tight either! It’s also a lot longer on me (tea length) than on the model. Y’all are a bunch of leopard lovers out there last month! My kinda ladies! 😉 Here’s a look at all your September faves! Rose Gold Pumpkins (on sale!) seems we are all pumpkin crazy right now! 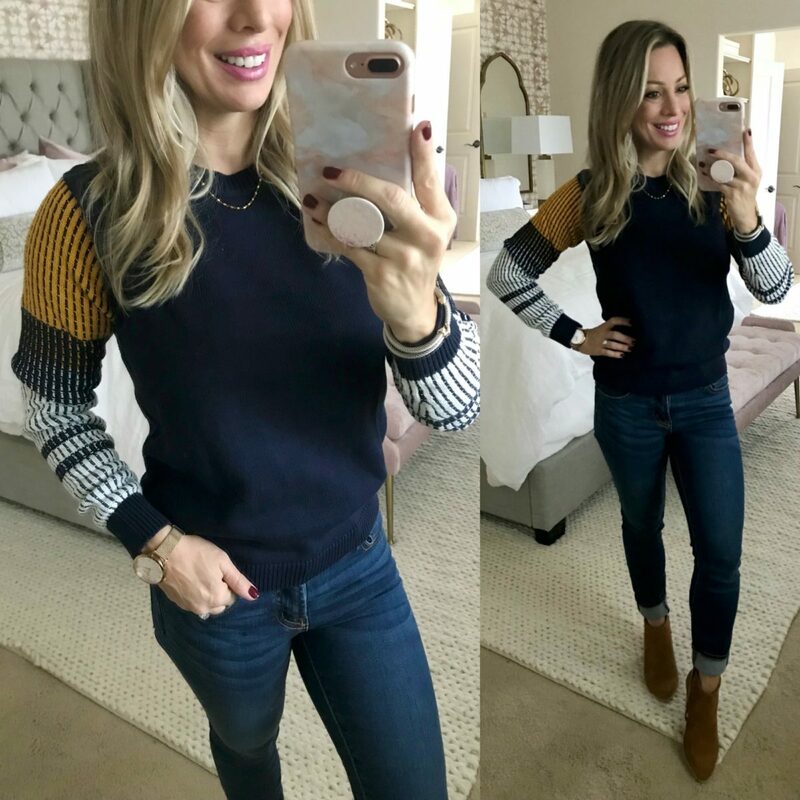 This 20% Off v-neck long sleeve striped sweater looks long enough for leggings and thin enough to be a good bottom layer! 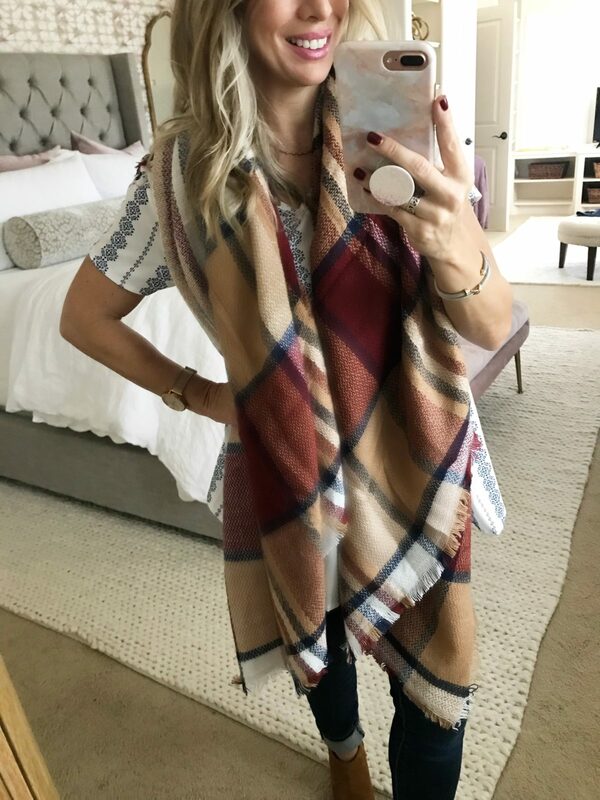 This plaid blouse gives all the fall feels and it’s still perfect for dressing up for work! It’s a great weekend to shop all sale stuff an extra 50% off!! Last year’s fall sweaters were all about the bell sleeves. 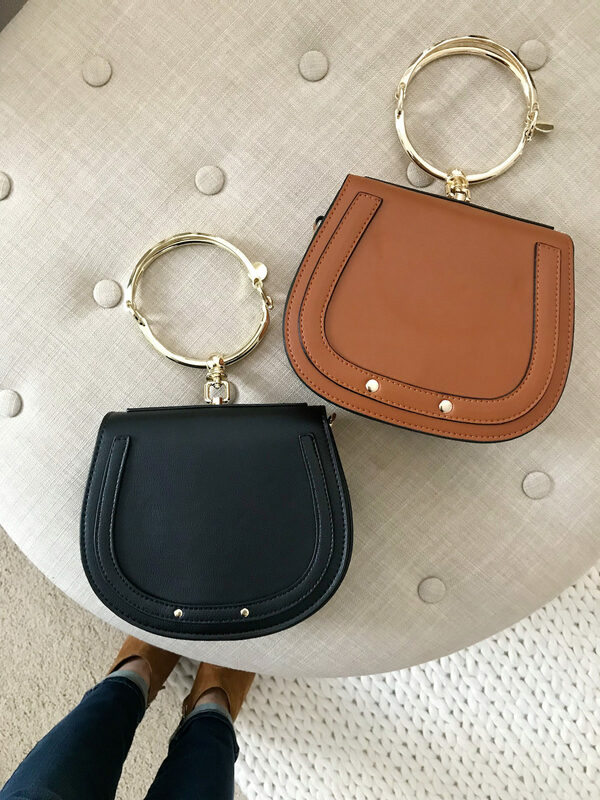 They’re back this year and I’m loving this double bell look for under $30!! Everyone needs a Classic Cable Sweater, you can get this one for under $15 – and the whole store is at least 20% off! 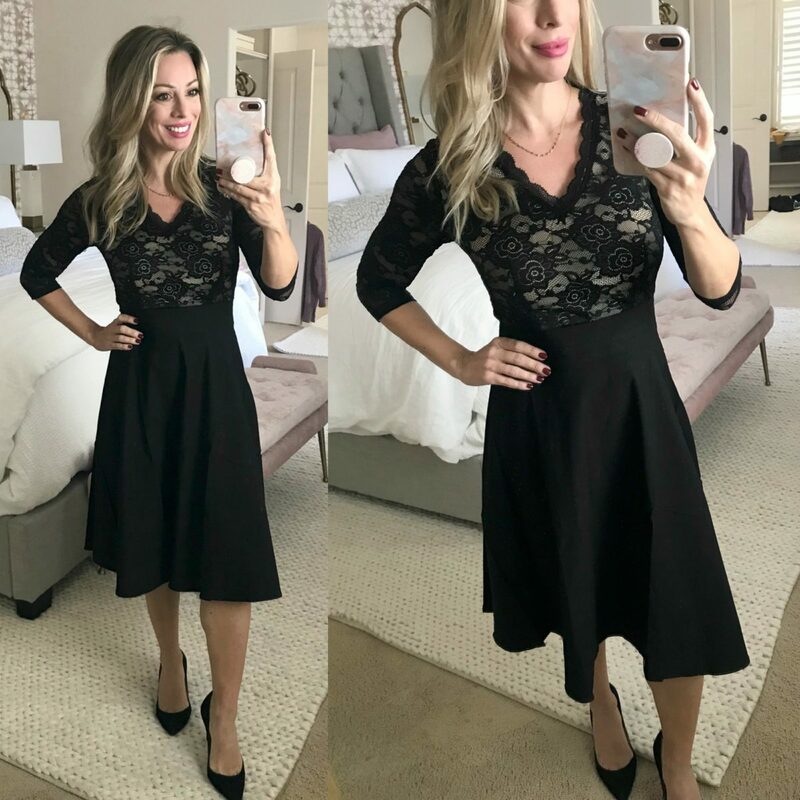 This polka dot midi dress with shirred sleeve is on sale for under $40! I found some of the prettiest nail polish colors on sale! Neutrals, sparkles and classics! You can get them all 3 for $10! To our friends in Florida affected by Hurricane Michael, I know y’all are strong and resilient. Our thoughts and prayers are with you. That black dress is one of my faves too! Tons of good finds! That contrast sleeve sweater doesn’t look so cute on the listing, but it looks adorable in your try on! I’ve thought about that tie top a few times but the picture doesn’t do it justice! Excited to try it!! It’s true you really have to see things in person on Amazon to know how they look in person. So glad this post was helpful for you! New to your site, popped over from Sheaffer told me to and boy am I happy I did. You really knocked it out of the park with your Amazon finds. I’m having a really hard time not buying EVERYTHING. One thing that caught my eye and Sheaffer has a pair also are the wedge sneakers. Are they comfortable, they sure are cute. Hi Karen! Thanks for stopping by! Isn’t Sheaffer a hoot?! She’s one of my favorite people! Those wedge sneakers are comfy, but they run narrow! What color is the orange cardigan listed as?? Is it brick?? Hi Kathy, yes, the color is called “Brick” in that cardigan sweater. I love the leopard print flats. I’ve been searching everywhere for some cute ones like that. These are good! I’ve been wearing mine nonstop! I wore the black dress to an annual gala last December and received quite a few compliments. Thanks for the amazon reviews! I bet you looked amazing! I felt really classy and elegant in it! Thank you for getting that dress! I purchased the black and another color. I could not love them more! 💕 I am excited for a fancy event so I can wear them. Thanks so much for letting me know Sarah!